The feature-packed design and robust construction of the MicroLux® Milling Machine makes it well-suited for your most demanding model shop projects. Its smooth operation lets you put fine finishes not only on machinable metals, but on non-metals like wood and plastic as well. For operating convenience, we've equipped it with .050 inch-per-turn table feed screws and dials, and the headstock is lever-actuated to make drilling operations a breeze. The column can also be tipped for angled milling and drilling, and easily separates from the base for one-man relocation or storage. 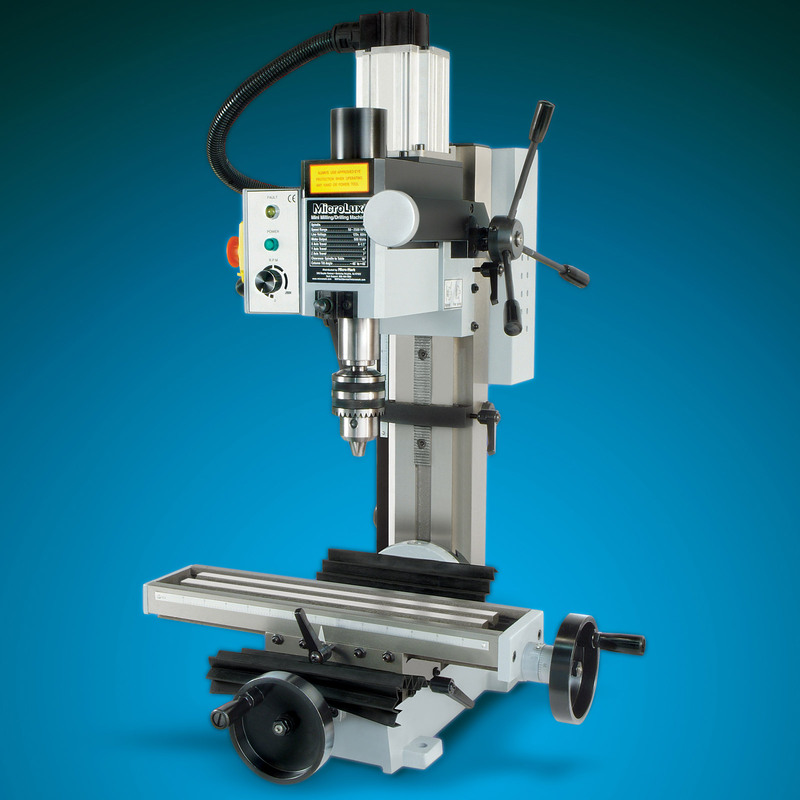 The MicroLux® Milling Machine is the perfect companion for your MicroLux® Lathe . . . it's also backed by Micro-Mark's guarantee of hassle-free product service. #84630 MicroLux® R8 Milling Machine includes variable-speed 500 watt (2/3 hp) brushless motor with ultra-quiet belt-driven spindle, 1/2 inch drill chuck and drawbar, table locks, column lock and drill stop, power supply with feedback-sensing power boost circuitry, spring-assisted headstock return, V-way chip guards, chuck/collet chip guard, indicator scales for the X and Z directions, fine-adjust knob for the Z direction, safety cut-off switch, wrench set and instruction manual/parts diagram. Use our shopping cart to calculate freight charge for shipments outside 48 contiguous U.S., or call our order line for assistance.Note: Some assembly required. Just Look at These Features! Weight: 110 pounds (basic machine without accessories). I struggled for years with a crappy mill. I bought my Micro Mill about a year ago. After a few hours of assembly, adjusting and lubing everything it was ready to work with. <br>The variable speed control allows for proper speed to feed rate to be easily maintained. I installed the available DRO on all 3 axis. This along with a quality CNC vise allows me to produce accurate consistant parts with ease. <br>I use my machine almost daily on steel, iron, and aluminum with no issues. <br>THIS IS the Mini Mill you want. Great Mini-Mill, you will not regret it. I bought this when it was 899.00, I have enjoyed using this machine because I use to be a Tool & Die maker. I am no longer one yet I do very much like using this mini-mill because it has the strength to cut metal but I would recommend keeping it to mild steel or softer. <br>Saying that, this little guy can cut aluminum all day long and not have a problem. If you are a professional tool maker then you may not need a digital speed readout for your spindle but since this guy is small and speed does make a big difference, I do recommend it to save you a lot of time getting the correct speed. <br>I recommend the Microlux High Precision Heavy Duty R8 miniature milling machine. It is a very good machine to have in your garage or shed because it is small but very useful and it only requires 110-120v outlet. <br>Make sure you grease down everything when not using it, after all it is steel and will rust in high humidity states. <br>Rotary table with 4 jaw independent chuck will be my next purchase. Lots of sturdy, precise steel for the money. Larger and more robust than expected, good sale price, prompt shipment. Easy, accurate operation. my only initial concern was less than ideal assembly and setup instructions. Read every word and understand each step, especially in take- down, wiring, and re-assembly of the electronic assembly. If you are new to milling machines do some research on basic design and use of this tool.